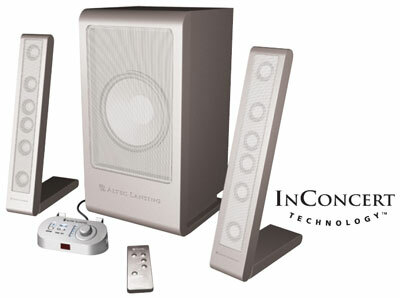 Bottom Line: The Altec Lansing FX6021's are a great sounding system. They don't pack much power, but the treble is exceptional. Altec Lansing has served up one of thier most expensive personal audio systems, their FX6021's, and today we get up close and personal with them. When comparing the components involved with the FX5021's, the systems are identical. Both come with two satellites, one subwoofer, a control panel, and a wireless remote. However, the look and specs of the two systems differ quite a bit. The FX5021's have a total continous power level of 90 Watts RMS which is actually higher than the FX6021's 75 Watts RMS. The FX5021's are also rated louder than the FX6021's with a signal to noise ratio @ 1 kHz input of 80dB, 5dB higher than the 75 dB level of the FX6021's. The lack of power is a disappointment in the FX6021, but it seems as though Altec Lansing had quality of sound as their number one priority rather than just making a loud system.